Previous What Happens When Smith Girls "Lean In"? Owner Jerry Wang calculates the scores from the Magic tournament, being screened via security camera. 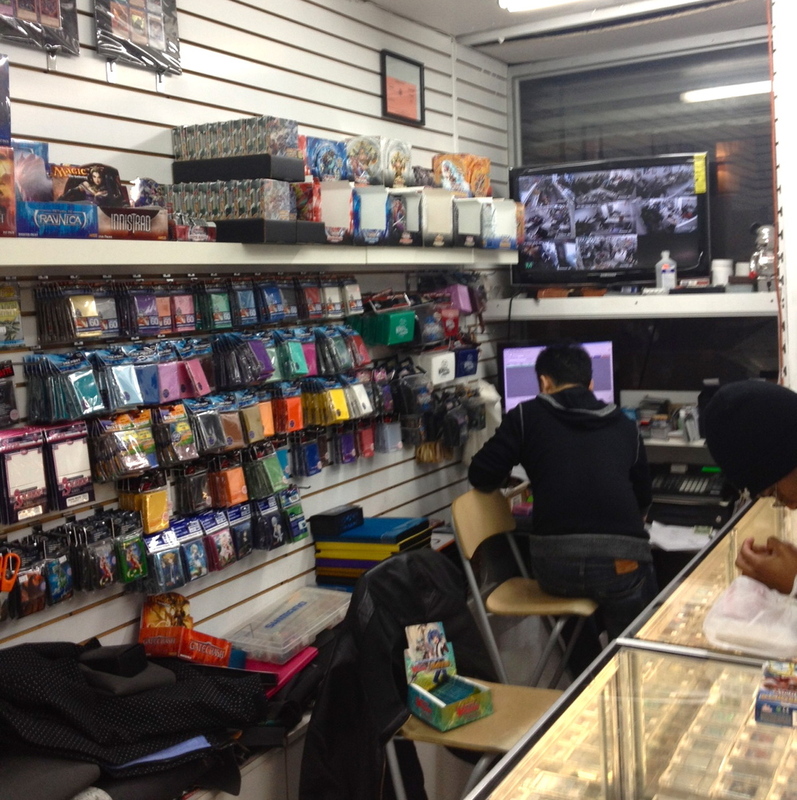 On the first block of Elizabeth Street, #6A, Nebulous, is a store and tournament center for Magic and Yu-Gi-Oh! card games. Distributed since 1993 and 1996, respectively, the games have steadily grown in popularity over the years and have developed loyal followings. Clearly, there's a thriving business based just on selling the cards and organizing the players. I walk by there often, and every night it is packed with gamers. I decided to visit on a Friday night to understand the place's popularity, and its population. Soon after we started talking, Jerry had to go off to tabulate the scores for a Magic tournament going on upstairs, which was broadcast live via security cameras behind the cashier's counter. I decided to face my lifelong fear of teenage boys and approached a table with a group of what looked to be fifteen-year-olds. When I greeted them, they looked horrified. I pressed on. None of the boys would give me their real names, ages, or New York neighborhoods of origin when I began talking to them. I remembered a time in high school when my 14-year-old brother relayed a story in which his acquaintance had broken the cardinal rule of video games during Spanish class: “You just don't talk about it in public.” I'm assuming the same rule applies to speaking to a scary adult-looking girl who wishes to quote you for a blog. Got it. As I hung around more, the kids opened up to me. I learned they were playing for a card worth $160, called Abyssmegalo. One of the crew, Cam, was actually closer to my age, at 21. I joked that he could probably bring a beer in here to play. “I don't think Jerry would like that,” he said. Most of the kids at this table had only been playing “seriously,” as in, for valued cards, for less than a year. Ultimately I learned little about the game but a lot about NYC gaming teenagers. When I asked if they'd played anyone really good, anyone kind of “famous” on the gaming circuit, they pointed to Jerry. “He's so good. He's the best.” It was sweet, imagining Jerry as a sort of house father, the Wilbur Larch of a band of 21st century gamer teens (and, of course, 30-year-old men in hoodies). One boy in the group had mentioned he lived in “Livonia,” in between Brownsville and East New York and had quietly added, “three murders a day. Not kidding.” (In fact, the one square mile area of Brownsville had the highest rate of violent crime in 2011.) This place seemed like a safe space for him, where he could be a kid and enjoy an innocent hobby. I felt silly for being “scared” to walk in there. I couldn't imagine the grisly violence this kid had surely seen in his lifetime. And I understood totally the urge to immerse yourself in a world of monsters and points, deadly creatures without real-life consequences.